Lets kick off with the finished product. Cheap pens that the ink stick can be removed from. I generally use pens my husband picks up from hotels, the ones that solid white plastic seem to work best. Start by softening the clay in your hands, some colors take a lot longer to soften than others. 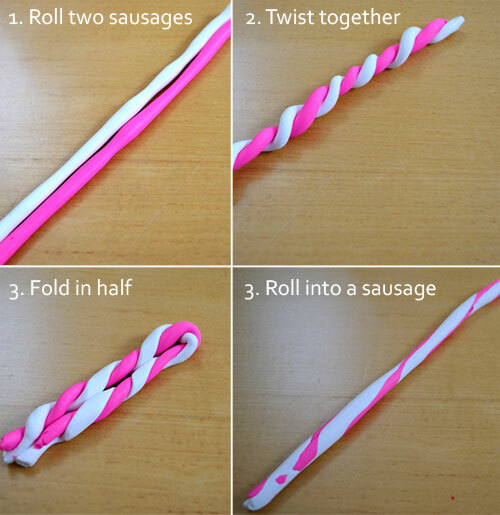 When they are nicely pliable roll into 12″ sausages, then twist together fold in half and roll this out into a 12″ sausage again. Cut sausage in half and repeat this process about 4 times. Slice the sausage into thin slices, remove the ink from the pen barrel and tile the clay pieces on as show, don’t worry about gaps. Then roll the pen on a flat surface and the gaps will dissapear. Bake according to the directions on your clay, re insert the ink and voila! Here are some more ideas. 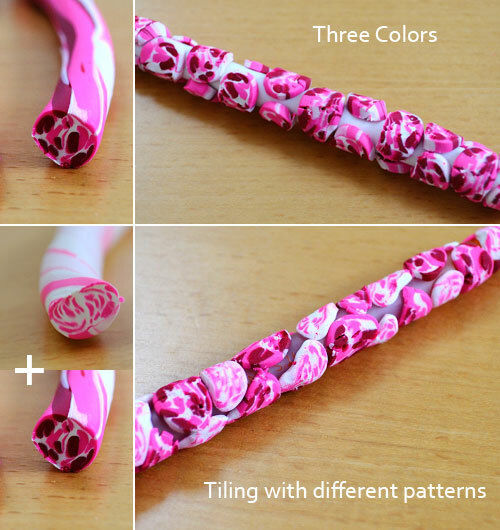 You can use more than two colors and multiple patterns on one pen barrel. Enjoy, I’d love to see photos of your results. Send them to me at creativeinchi@gmail.com and I will feature them! This entry was posted in Craft Projects, Polymer Clay. Bookmark the permalink. I love working with polymer clay! Reminds me to get back to it! Maybe i'll make some of these for valentines day! Hi Margo, I'd love to see any you make! This is an idea my teenage daughter originally brought home from an art class at school so I am sure your daughter will love this project! ummm for some reason blogger has "eaten" some of the comments I approved on this post…sorry! Making some of these tomorrow 😀 I love this idea!! wonderful…I'd love to see them, if you send me a picture I'll give you a shout out! 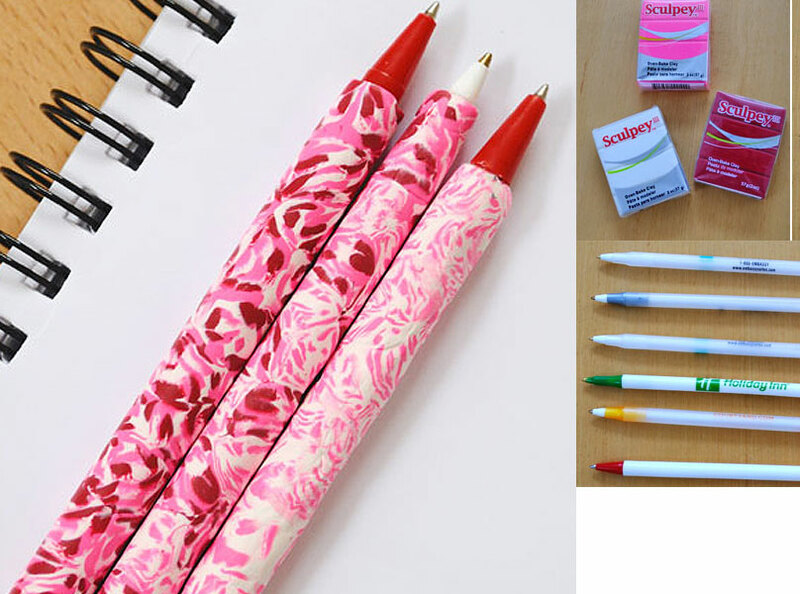 The one thing I would suggest is to use the classic white Bic Stic pens only. I have found that those are the only ones that don't melt in the oven. 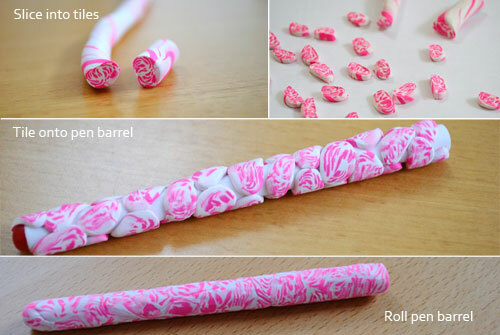 Otherwise, I love using and making stuff with the polymer clay! Great ideas! I hope the solid pens work. I wish I could give a definitive guide as to which pens work and don’t mess up in oven! Some pens melt – don't use Staples brand. They melted on me. I used the clear papermate Bic pens & they were fine. Don't cook them more than 10 min either. Gorgeous and simple! Thank you for sharing. My daughter is making them at her 9th birthday party. She is so thrilled! She's planning to use them as gifts for her teachers, too! great birthday party craft, the kids will love them! I always wanted to learn how to use p.clay. I love the pens, but is there anything easier? I did these and I used Wal-mart stick ball point pens and Sculpey, it worked wonderfully i used a thin layer of clay on these and 5 minutes was enough to bake the clay without melting the pen. I wish I had a camera to post pictures of them. Thanks for the tutorial! I couldn’t wait to try these! We got them made and they looked great…. Until we put them in the oven. We had two different brands, one was a staples brand (with white plastic shell) and the other was bic brand (clear plastic shell) . We checked them after a few minutes in the oven and the pens were melted. 🙁 Do you have any suggestions?? Thanks! I usually always read comments before trying any pin. I regret that I didn’t and my Bic pens melted. Sad. I will try again in the future following the recommendations of the others. But, the first part was fun and easy nonetheless. so sorry your pens melted…I would love to be able to nail down exactly the make and brand of pen that works for this project. I used free hotel give-away pens and who knows makes them! I want to make a couple of these for mt mom, who uses those erasable ink pens forcher crossword puzzles. 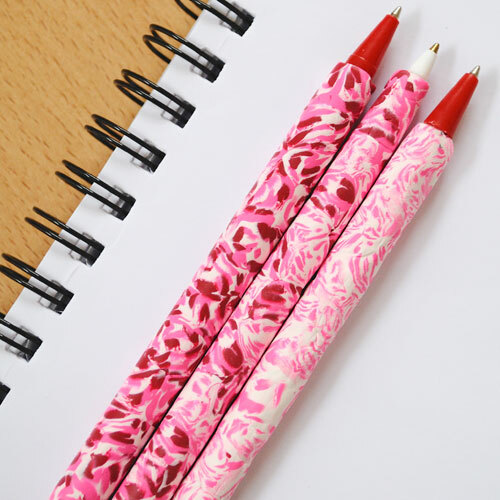 Do you think those pens would melt? I wish I could say! I’m thinking this is a great idea! I need to try this myself! I got a cheep hotel pen and I’m gonna try this ASAP! Do the pens dry out without the caps? Could you do any other designs? The design options are endless just by using different colored tiles! I have never had a problem with the pens drying out! This is such an easy and fun project! My second period teacher made one for all of her students and so I decided to go and make some of my own for Christmas! Thanks for sharing! Glad you had fun with this project, it can get quite addictive!